US, 2000, 109 minutes, Colour. Jeff Goldblum, Anne Heche, Nancy Travis, Timothy Olyphant, Joe Santos, Richard T. Jones, Kim Coates, Max Perlich. Auggie Rose is a very pleasing surprise. It is a film of deep humanity. 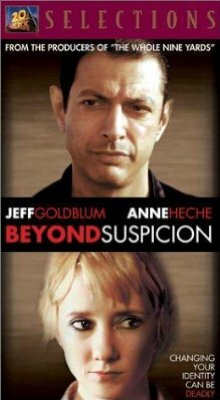 Jeff Goldblum gives one of his best performances as a middle-aged insurance salesman who is involved in a shooting in a diner, accompanies the wounded man to the hospital, feels that he has had a contact with him as the man was dying. He then begins to investigate the man, takes on his identity, becomes involved with the pen pal of the dead man while he was in prison. The film is very much about midlife crisis, looking at one’s life and career, reassessing and taking opportunities to move into another phase of life. This plot may seem extreme but the writing and the performance give it great credibility. It is similar to a number of films made in the 1990s about men in midlife and their crises and changes, like The Doctor, The Fisher King, even Regarding Henry where Harrison Ford is also involved with a shooting incident in a diner but is shot himself, losing his memory, having to re-evaluate his life. American Beauty also came out in the year before Auggie Rose. There is a fine supporting cast, Anne Heche at her best as the country girl who was writing to the dead man in prison, Nancy Travis as the insurance salesman’s girlfriend, Timothy Olyphant as an oily criminal, Joe Santos as a genial neighbour, Richard T. Jones as the investigating police officer and Kim Coates in the flashbacks as the dead man. The film is well written, is credible even though when one looks at the plot it may not be so credible. However, that does not matter because we experience the journey of the middle-aged man and the effect of the journey on others. The film opens with a funeral, it ends with a funeral so that the whole film is a flashback – with the name on the gravestone of John Nolan instead of Auggie Rose, ‘Freedom at last’. 1. The appeal of the film, to male audiences, identifying with John Nolan? To female audiences? Age, professional people? Those interested in life changes? 2. A Los Angeles story, the insurance office, the building, the staff, the spiel for clients, the contracts? The contrast with the less affluent aspects of Los Angeles, the delis, the apartments, diners, prisons? The musical score? 3. The framework, the funeral, the audience discovering that the whole thing was a flashback, John Nolan’s name on the tombstone? 4. Jeff Goldblum’s performance as John Nolan, his age, style, his working with his staff in the office, his friends, the persuasiveness of his talking to his clients, the audience believing him? His relationship with Carol, the tensions, their not getting married, the reasons, the passing of the years? John Nolan as a sympathetic character? 5. The episode in the deli, his wanting the bottle without the scratched label, Tony and his friendship, Auggie Rose as the new stock keeper, getting the bottle, the shooter, John Nolan on the floor, Auggie Rose being shot? John cradling him, the blood on his clothes, the eye contact, talking, Auggie Rose reassuring him? The police coming in strongly with the guns, getting the ambulance, John accompanying Auggie to the hospital, in the hospital, talking with the doctor, Auggie’s death? The police and his giving statements? 6. The repercussions, the police informing him that there were no relations, disposing of the body? Trying to stop John becoming more involved? His going to the prison, discussing Auggie with Oscar Weeks, learning his background, the twenty years in prison? The prisoner asking him to set off the alarm for old times’ sake and his doing it? Going to the apartment, searching it, the arrival of the postcard, finding the letters, reading them, the neighbour and requesting him to water the plants? 7. The interview with the police chief, later, Officer Decker and his sympathy, his talking about his own six months off? The arrest of Roy? 8. Lucy, coming alive through the letters, the voice-over? The plan to meet, her arriving at the bus station, John meeting her, intending to tell her the truth, or not? The cup of coffee, her babbling, going to his apartment? John’s difficulties in managing with the mobile phone, the calls, his affluent car etc? His trading in the car for a bike? 9. Carol, her love for John, the tensions, not being married, her regrets? Wanting phone calls? John’s absences? Packing his case? Feeling excluded from his change? The end, going away by herself? 10. Auggie, his life, as a young man, in detention, robberies, the twenty years in prison? Never seeing the moon? Getting out, the letters to and from Lucy? His ability to write? The books and his reading? The bond with Lucy, the job, the hopes, pawning his parrot, the suddenness of his death? The pathos? 11. John becoming Auggie, knowing so much about him, feeling him, the identity, the parrot, redeeming him, the apartment, the books? Listening to the boxer and his stories, the rich plants in his room? With Lucy, falling in love, a life with her? 12. Going to the office in the Hawaiian shirt, Lucy’s gift, the secretary and her concern, talking with her, his partner, withdrawing, seeing the clients? 13. His application for jobs, people not wanting to give jobs to an ex-con? 14. Getting the job in the deli, making the sandwiches? The boss, working, the couple with the sandwiches, meeting them later? 15. Roy, the meeting, the explanation of the job, their talk, the gift of the gun, John’s dilemma, hiding the gun? Lucy pulling it on Roy? Roy following the car, getting the information, going to the office? His confronting John? John getting him the insurance policy, the promise, John going to the police, Officer Decker coming to arrest him? 16. Lucy, telling the truth, her marriage, the annulment, her visit to Los Angeles, falling in love with Auggie? 17. John, telling his story, Lucy hurt and leaving? 18. The new life, the grave, the name on the stone, freedom? 19. John’s new life, more real, with real people, at the diner, talking with the next-door-neighbour, the people in the deli, opportunities and possibilities, Lucy’s return?